So I sit there and go through my stash. Why can't I make my mind up? This is why I only aver used to have one kit at a time and just make that one! 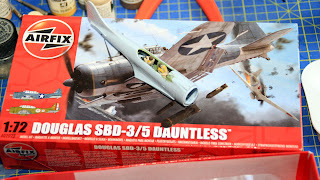 I decided that I needed a challenge for my first start up (forget that I am half way through a 1/35th Valentine tank and a 1/12th Shelby Mustang car!). 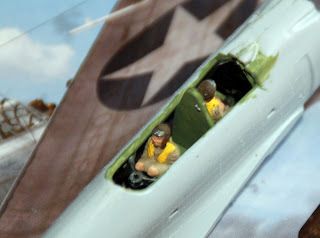 Sitting in the stash was one of the old SBX mistakes - kits that I bought for customers that were either cancelled or I duplicated. Normally, these would have been E-Bayed out but this one got missed as it was a very late event in the SBX story. What is this wondrous kit that I am all fired up to make? An Airfix 1/72 Douglas Dauntless - recent release but on of their, what I call, shrapnel boxes. 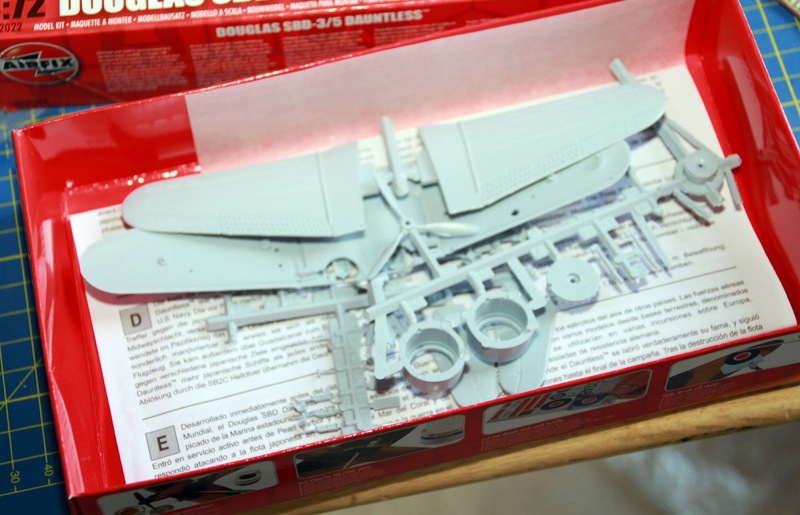 This means that it is a latest release but a very old kit that comes in a poly back of bits of plastic that might be of some shape but with each piece noted for its flash - oh - and it must have rivets that can cut your finger if you run one along the fuselage. I think I am back up and running. After a few weeks settling into the new apartment and getting used to a new way of life, I now have my modelling desk in operation. As I still had a trade account, I indulged myself when we closed SBX . I got myself a new extractor unit and a TR0 trigger revolution Iwata airbrush! This is what the desk looks like. I think that this set up should be very conducive to sitting there modelling. As you can see, I have an extractor unit, a large cutting board, a Daylight light and two drawer units. The top unit is full of paint and Alcad - mostly Vallejo but with some special colours in Lifecolor, Xtracrylix and (avery few) Tamiya. The bottom unit is full of tools and modelling materials such as brass wire, etc. I have a separate stash of glues and masking material and a large stock of Vallejo polyurethane primers. I spent quite a lot on back up materials whilst I could still get a trade discount. For instance, my favourite glue is Plastic Weld which is a highly volatile solvent containing Dichloromethane. Sticks instantly and evaporates almost instantly so you can slosh it on the outside of a model and it never marks anything - just sticks very quickly. I now have 12 bottles! That should last me some time. 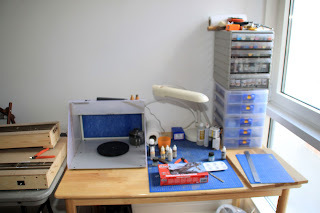 Plus, things like my favourite primer - Vallejo Black Polyurethane primer - I got in boxes of 6! I also arranged to get a Sonos 3 speaker network audio unit in the room. This is fed from a central network hub and can play different music from that coming out of the 5 speaker unit in the living room or can be grouped with it to play the same. I now have brilliant access to all of my old jazz plus Internet radio etc. My trusty Mac Mini is close by for any check up on web information. Plus, I have my stash to work through. I should be the happiest bunny around! I have sorted out my hobby room in the new apartment. It has a dedicated modelling table. I have bought an extractor for airbrushing and I have invested in a trigger Revolution TR0 airbrush which might stop my knuckles hurting during extended spraying sessions. Now to the problem. Those of you who know me know that I have never maintained a 'stash'. I have always bought a kit - made it - and so on. As I was about to lose my trade purchasing ability, I have stacked up on kits. Now, I look at the list and can't make my mind up what to build. I open one box after another and put them all back! Make your mind up David!!!! I will make a list of my stash - you will be puzzled by the variety of kits - in any case, I am - grin.